Many people are just learning about the industry, and don't realise that there is more to a solar system than a panel and some cabling. This is a basic guideline to give you an idea of what you need to make a system work for you. Building a Solar System,when building the first and most obvious component in your solar setup is the array of panels. An important point with solar panels is that the voltage is always higher than 12V (usually around 17.5V). When you work out your panel requirement you must use the amperage rating, not wattage, as the higher voltage means lower amperage and therefore the wattage can be misleading. You should always check the specifications when buying solar panels. Example: A 100W, '12V' panel is actually 17,5V. The amperage this panel will give out is not 100W/12V, but rather 100W/17.5V = 5.7 amps. Your next component is the charge controller, also known as the regulator. Solar regulators are different to ones used for wind power. There are hundreds of different types of regulators with sizes ranging from 5 Amps to 80 Amps. You also get different types; the normal, straight-forward regulator which is great for smaller loads, and the MPPT regulator which adds about 20% efficiency to the system and is used for bigger systems. 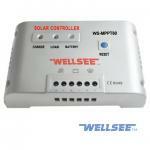 The regulator size requirement is determined by the amount of energy supplied by the panels. The rating of the regulator is how much energy it can handle per hour. Example: A 60 amp controller will handle 60 amps per hour. Any energy in excess of that rating (in this case 60 amps) will be wasted, therefore it is important that you don't undersize your regulator. Next, you need batteries; there are many different makes and types available. Normal marine deep cycle batteries are more commonly used for smaller systems, while the special high amperage solar batteries are ideal for larger installations. Normal car batteries will not perform well with solar power systems because of their shorter life spans. It is a bad idea to draw all the energy out of the batteries. We give them 50% depth of depletion, to prevent damage and lengthen their life span. Example: With a battery of 105 amp hours, we work on 50 amp hours of useable storage. An inverter is the final step in your basic solar system (before the distribution board). 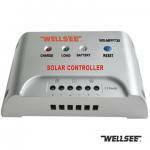 Solar setups are always DC (12V, 24V, 36V or 48V). What the inverter does is it converts the DC voltage into AC voltage to run your normal everyday appliances. You get appliances with 12V configurations nowadays, which allow for a direct connection from the batteries to the appliances or db board, cutting out the need for an inverter. Cabling, lugs, switches and connection boxes are smaller, yet essential components. The quantities are determined by the size of your system, the number of connections and the distances between components. With a 12V system, it is advisable to keep the panels and batteries within 10m of each other. The regulator and inverter should both be placed near the battery bank. The cable thickness is determined by the size of your system and the distance that the energy will travel. If you're using a 12V, 1000W system with a distance of 10m, you need 10-12mm cabling. If the cabling is wrong, the system will under-perform or even burn the wiring. The voltage of a system is determined by the amount of energy running through it. Anything up to 2000W can be run through 12V; from 2000W to around 5000W can be run through a 24V system; and from 5000W up to around 20 000W, a 48V system should be used. Anything higher needs 240V. It is also a good idea to get a combiner box, which allows you to plug all of the wires from your panels into one box, with a single wire coming out from the other end. This just neatens the system and makes it more manageable for installation, maintenance and upgrades. It is highly recommended that fuses be included in larger systems, as they prevent short circuits from happening. If the wiring has been damaged somehow and the positive and negative wires touch, a short circuit will occur, and could potentially start a fire or even cause the battery to explode. Diodes allow the current to run in one direction only, like a valve, preventing the energy from running back into the panels from the battery bank. If this occurs, it can damage the panels, particularly with more powerful batteries.